Well Barrel season 2013 is around the corner and seems like everyone is starting to get in shape. In a sport that is win or lose by a milla second every little thing counts. Or if you are headed to Key West in February every little pound counts. 36 Days Ladies and Gentlemen. No matter if you are watching what you eat, exercising or both the point is you are on the right track to a healthier you and perhaps a better place in the race. It is not how skinny you look, what number is on the scale but it is about being healthy. We chose Body By Vi for a kick start and a healthier way of life. We love it. Honestly we joked about it when it was all over Facebook then we saw the results and decided we better try it – well it stuck. We have always tried to eat healthy but we both agreed we needed to exercise and eat healthier. We took some time away from the routine at the holidays but we are right back on track. Everyone is human and will have a bad day here and there but the important thing is to get back on track. Maybe you want to count points, get a meal delivered or have a great Body By Vi shake whatever you pick find what works for you and just do it! Healthy is the key, non of us are getting younger and hopefully we are all getting older! We looked into our gym options and trainers like everyone does then we decided we have all the tools we need are at home and if we can not be disciplined at home, how in the hell would we be at a gym. So we sucked it up and used the Internet as a tool for gathering home exercises and away we went. We realized that our body and mind were really the biggest tools that we needed to make this happen. Each week we add a new little exercise to add to the daily routine. 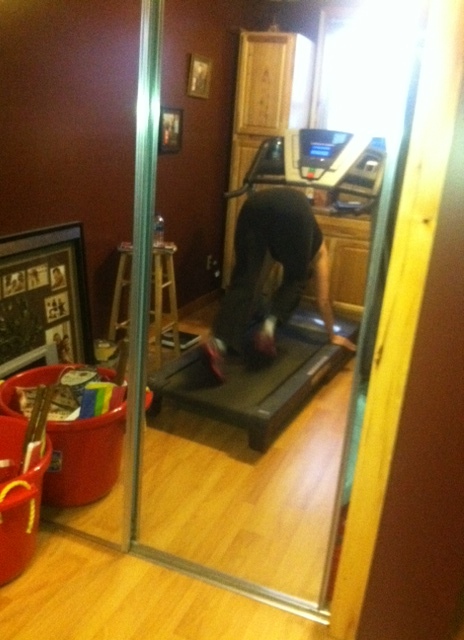 Today my trainer, Jillian Remington decided that I needed to try a new treadmill move. I did and if you didn’t see Facebook this morning here it is. As you can see the blurr of my shoes, I was moving so fast it was like 60! Clea then posted – Fast like the scooter in The Bahama’s (see scooter story below). Jan 8th change up: With the treadmill OFF put your hands down on the side of treadmill rails with your feet positioned back on the belt start running as fast as you can for as long as you can then jump your feet to the side rails for a breather and then repeat. Keep you hands and head down til completely done. Do 3 times then drink lots of water and get your Oxygen. Hope this helps you. Your legs will hate you at first but your mirror will start to love you. Remember Healthy is Best and everything else is a bonus. Be kind to everyone and love one another a little more than you think you can. PS While we were in The Bahamas we rented a scooter and well let’s just say it was our first scooter experience. So looking like Dumb and Dumber but in the summer, we all headed to the beach and as Clea and I are traveling down the road going 60 (hence the Facebook post response). People are passing us – bus loads of tourist from the cruise ship, they are all smiling and waving and we are thinking they are flying man we are going 60 Good Lord. The Meeks and Crew (6 of them) are in the mid size Bahama Car (a Yugo that is in the USA sits 4 at most) ahead of us. We all arrive at the beach and as we pull up to the The Mid Size Car (our scooter was bigger) the Crew is falling out of the car and we say. Did you see all those people passing us? Hell we were going 60! Then as I look down at the speedometer again I say to Lloyd (i.e Clea) Hey we were only going 25 it is in Kilometers…. blahahahahahah we laugh all the time about this. Good Times Good Memories. Someday we will tell you about the trip back to the cruise ship and wide turn we had to take…. off the road. Previous A Friend of a Friend needs a little boost! The Stories you guys remember will be 10 times more than most people ever experience! Make sure you video if that Treadmill bucks one of you off! I have a serious scarring experience from doing a move very much like that UNINTENTIONALLY with my treadmill…. It took me almost two weeks to heal up and I never got back on that treadmill. Hahaha! !